The Bryan Custom Collection - "The Gary Bryan difference" is, we build one of a kind kitchens, using only the finest materials, quality construction, and premium finishes, with special attention to the details. 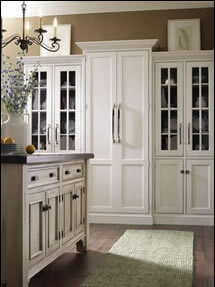 Plain & Fancy - Beautiful high end cabinetry. Widely recognized for excellence in cabinet design. Vast selection of door stles and finishes. A Certified Participant in the KCMA's Environmental Stewardship program. Aristokraft - An industry-leading cabinet manufacturer, offers quality wood cabinets for any room in the home. Why The Bryan Custom Collection is the most value for the money. Most cabinet companies have 3 mark-ups. Cabinet company, the manufacturer, the representative between manufacturer and cabinet company. Freight is very expensive. We build our cabinetry here, so there is no hidden freight charges. Very expensive to box cabinet. We deliver ours with furniture pads. no boxing.